Sometimes, finding the perfect cleaning solution to a problem that you have isn’t always easy; some methods for cleaning are better than others, it is more about personal preference and what works for you and your home rather than just following what other people do. Getting your own routine and implementing it is important, but sometimes there might just be an easier way that you have never considered before, even saving you time and stress, so keeping an eye out for great cleaning tips, which can save you time and money, has advantages for you. There are cleaning tips that you might not have heard of or have found a new, faster or cheaper way to clean an item and by bringing them together you get a better, easier way to find these great ideas. For me I am turning to natural products for cleaning and that is just one of the reasons I love this article, it tells you about a natural cleaning product and the best uses for cleaning. I hate cleaning my oven. I used to clean it with chemicals and they would make me feel ill. I, too, have found better cleaning options which clean and don’t leave you feeling sick. If you are looking for cleaning tips for when the children go back to school then this gets written with you in mind. Keeping your kitchen clean is important and this article does help to highlight the easy option and the best methods for cleaning. If you want to use your cleaning for some exercise then this article might give you some inspiration as to what you can do. 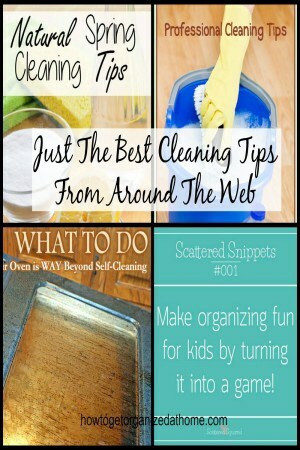 If you need cleaning tips for cleaning with small children around you, then check out this article, it will give you some great advice when sometimes you can think that you will never get any cleaning done. This is a great resource for cleaning tips with loads of information on many different topics all revolving around cleaning. Have you ever used a caddy when cleaning, to store your supplies? This article will go into detail about the benefits of using one. If you are looking for the perfect household cleaning products that you are able to make at home, then these recipes might be perfect for you. Making your own cleaning products means that you know exactly what you are putting in them and they are less likely to cause harm to the health of your family or you. If you are hoping to find some secret cleaning tips then this is the perfect article for you. Cleaning is a personal preference and as long as you are happy with how clean your home is, then you are doing a grand job. However, if you think there is an easier way to get something clean then you are probably right. Finding these cleaning tips is difficult, which is why this article brings together cleaning tips from around the world. Sharon, thanks for doing all the work of gathering all these resources together. Thanks for sharing our post, Sharon! You are so welcome! Thanks for writing an awesome one to share!